Let us investigate the spinning motion (i.e., the rotational motion about an axis passing through the center of mass) of an aspherical moon in a Keplerian elliptical orbit about a spherically symmetric planet of mass . It is convenient to analyze this motion in a frame of reference whose origin always coincides with the moon's center of mass, . Let us define a Cartesian coordinate system , , whose axes are aligned with the moon's principal axes of rotation, and let , , be the corresponding principal moments of inertia. Suppose that , which implies that the moon's radius attains its greatest and least values at those points where the - and -axes pierce its surface, respectively (assuming that the moon's shape is roughly ellipsoidal). Let the planet, , be located at position vector , , . We can treat the planet as a point mass, because it is spherically symmetric. Incidentally, we are assuming that the moon's deviations from spherical symmetry are of a permanent nature, being maintained by internal tensile strength, rather than being induced by tidal or rotational effects. Of course, an equal and opposite torque, , acts on the moon. where use has been made of the standard Keplerian result (assuming that the mass of the moon is much less than that of the planet). (See Chapter 4.) Here, and are the moon's orbital major radius and mean angular velocity, respectively. 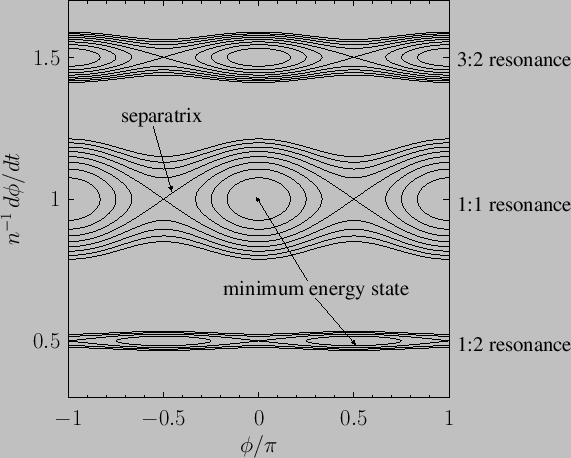 Figure 8.7: Geometry of spin-orbit coupling. where any terms have been neglected. Here, use has again been made of the trigonometric identities in Section A.3. Figure: Surface of section plot for solutions of Equation (8.166) with and . The major spin-orbit resonances are labelled. Equation (8.166) is highly nonlinear in nature. Consequently, it does not posses a general analytic solution. Fortunately, (8.166) is relatively straightforward to solve numerically. In fact, the solution can be represented as a trajectory in , , space. Because Equation (8.166) is deterministic, a trajectory that corresponds to a unique set of initial conditions cannot intersect a second trajectory that corresponds to a different set of initial conditions. Unfortunately, it is difficult to visualize a trajectory in three dimensions. However, we can alleviate this problem by only plotting those points where the trajectory pierces a set of equally spaced planes normal to the axis. These planes are located at , where is an integer. This procedure is equivalent to projecting the trajectory onto the , plane each time the moon passes through its pericenter. The resulting plot is known as a surface of section. 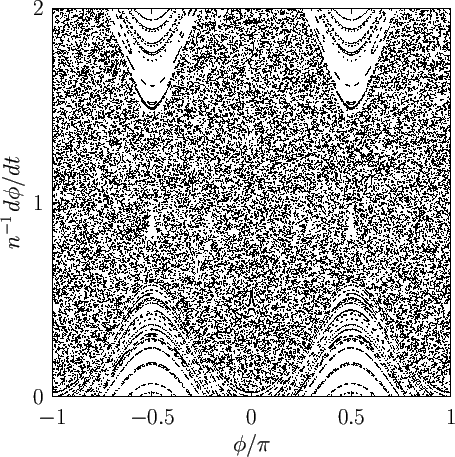 Figure 8.8 shows the surface of section for a set of trajectories corresponding to a great many different initial conditions. All of the trajectories are calculated from Equation (8.166) using and . The relatively small value adopted for the eccentricity, , is consistent with our earlier assumption that the moon's orbit is nearly circular. On the other hand, the relatively small value adopted for the asphericity parameter, , implies that the moon is almost spherical. It can be seen, from Figure 8.8, that a trajectory corresponding to a given set of initial conditions generates a series of closely spaced points that trace out a closed curve running roughly parallel to the -axis. Actually, there are two distinct types of curve. The majority of curves extend over all values of , and represent trajectories for which there is no particular correlation between the moon's spin and orbital motions. However, a relatively small number of curves only extend over a limited range of values. These curves represent trajectories for which a resonant interaction between the moon's spin and orbital motions produces a strong correlation between these two types of motion. The exact resonances correspond to the centers of the eye-shaped structures which can be seen in Figure 8.8. The three principal spin-orbit resonances evident in the figure are the 1:2, 1:1, and 3:2 resonances. Here, a : resonance, where and are positive integers, is such that times the moon's spin period is equal to times its orbital period. At such a resonance, the moon's principal axes of rotation point in the same direction every pericenter passages. 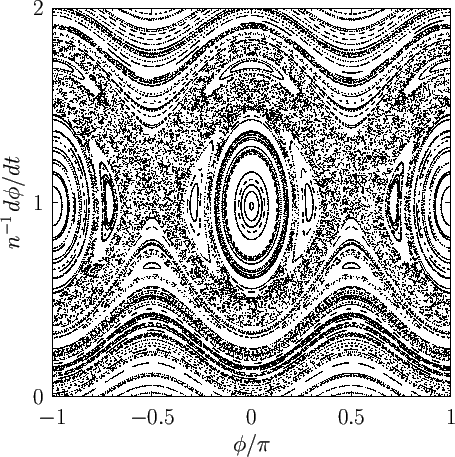 Figure: Contours of , for , plotted in , space for the : , : , and : spin-orbit resonances. The contours are calculated with and . 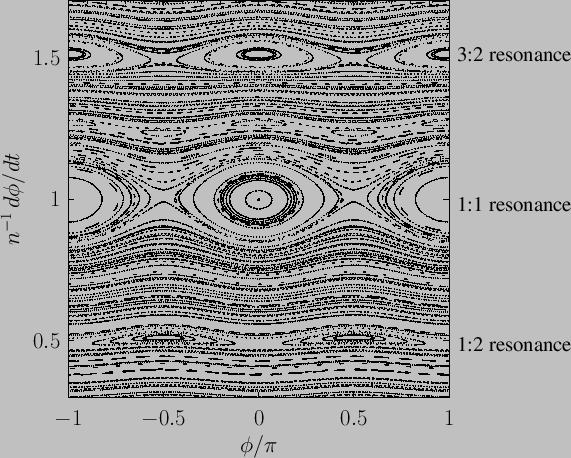 Figure 8.9 shows contours of plotted in , space for the : , : , and : spin-orbit resonances. These contours are calculated from Equations (8.175)-(8.177) using and . It can be seen that the contours shown in Figure 8.9 are very similar to the surface of section curves displayed in Figure 8.8; at least, in the vicinity of the resonances. This suggests that the analytic expressions (8.175)-(8.177) can be used to efficiently map closed surface of section curves in the vicinity of the : , : , and : spin-orbit resonances. Moreover, it is clear, from these expressions, that solutions to Equation (8.166) are effectively trapped on such curves. This implies that a solution initially close to (say) a : resonance will remain close to this resonance indefinitely. For a given spin-orbit resonance, there exists a separatrix, corresponding to the contour, dividing contours that span the whole range of values from those that only span a restricted range of values. (See Figure 8.9.) The former contours are characterized by , whereas the latter are characterized by . As the energy integral, , is reduced below the critical value , the range of allowed values of becomes narrower and narrower. Eventually, when attains its minimum possible value (i.e., ), is constrained to take a fixed value. This situation corresponds to an exact spin-orbit resonance. For the case of the : resonance, the minimum energy state corresponds to , and , which implies that, at the exact resonance, the moon's -axis points directly toward (or away from) the planet at the time of pericenter passage. Because we previously assumed that , which means that the moon is more elongated in the -direction than in the -direction, it follows that the long axis (in the - plane) is directed toward the planet each time the moon passes through its pericenter. In this respect, the : resonance is similar to the : resonance. However, for a moon with a low-eccentricity orbit locked in a : spin-orbit resonance, the -axis always points in the general vicinity of the planet, even when the moon is far from its pericenter. The same is not true for a moon trapped in a : resonance. For the case of the : resonance, the minimum energy state corresponds to and , which implies that, at the exact resonance, the moon's -axis points directly toward (or away from) the planet at the time of pericenter passage. In other words, the short axis (in the - plane) is directed toward the planet each time the moon passes through its pericenter. The best example of a celestial body trapped in a : spin-orbit resonance is the planet Mercury, whose spin period is days, and whose orbital period is days (Yoder 1995). Note that Mercury's axial tilt (with respect to the normal to its orbital plane) is only (Margot et al. 2007). In other words, Mercury is effectively rotating about an axis that is directed normal to its orbital plane, in accordance with our earlier assumption. It is thought that Mercury was originally spinning faster than at present, but that its spin rate was gradually reduced by the tidal de-spinning effect of the Sun (see Section 6.7), until it fell into a : spin-orbit resonance. As we have seen, once established, such a resonance is maintained by the locking torque exerted by the Sun on Mercury because of the latter body's small permanent asphericity. However, this is only possible because, close to the resonance, the locking torque exceeds the de-spinning torque. The best example of a celestial body trapped in a : spin-orbit resonance is the Moon, whose spin and orbital periods are both days. The Moon's axial tilt (with respect to the normal to its orbital plane) is . In other words, the Moon is rotating about an axis that is (almost) normal to its orbital plane, in accordance with our previous assumption. Like Mercury, it is thought that the Moon was originally spinning faster than at present, but that its spin rate was gradually reduced by tidal de-spinning until it fell into a : spin-orbit resonance. This resonance is maintained by the locking torque exerted by the Earth on the Moon because of the latter body's small permanent asphericity, rather than by tidal effects, as (when the eccentricity of the lunar orbit is taken into account) tidal effects alone would actually cause the moon's spin rate to exceed its mean orbital rotation rate by about percent (Murray and Dermott 1999). Here, is the angle subtended between the moon's -axis and the line joining the center of the moon to the planet. (See Figure 8.7.) According to the preceding equation, this angle librates (i.e., oscillates). The first term on the right-hand side of the preceding expression describes so-called optical libration (in longitude). This is merely a perspective effect due to the eccentricity of the moon's orbit; it does not imply any irregularity in the moon's axial spin rate. The final two terms describe so-called physical libration (in longitude) and are associated with real irregularities in the moon's spin rate. To be more exact, the first of these terms describes free libration (in longitude), whereas the second describes forced libration (in longitude). 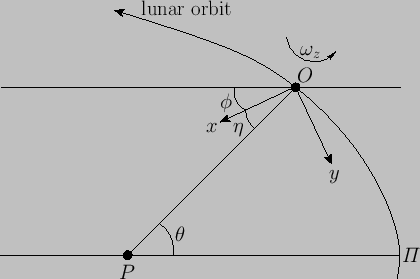 Optical libration causes an oscillation in whose period matches the moon's orbital period, whose amplitude (in radians) is , and whose phase is such that as the moon passes through its pericenter. 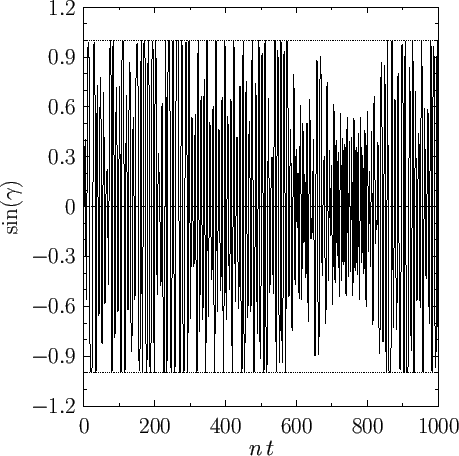 Forced libration causes a similar oscillation of much smaller amplitude (assuming that ). Free libration, on the other hand, causes an oscillation in whose period is times the moon's orbital period, and whose amplitude and phase are arbitrary. Figure: Surface of section plot for various solutions of Equation (8.166) with the Phobos-like parameters and . Because the observed eccentricity of Phobos' orbit is (Yoder 1995), the predicted amplitude of its forced physical libration is . The measured amplitude is (Wilner et al. 2010). Note that the and values for Phobos satisfy the resonance overlap criterion in Equation (8.178). Figure 8.10 shows a surface of section plot for Phobos. It can be seen that resonance overlap leads to the destruction of many of the closed curves that are a feature of Figure 8.8. Nevertheless, some closed curves remain intact, especially in the vicinity of the : spin-orbit resonance; that is, around , , and . Consequently, it is possible for Phobos to remain close to a : spin-orbit resonant state for an indefinite period of time. Figure: Surface of section plot for various solutions of Equation (8.166) with the Hyperion-like parameters and . Figure: Solution of Equation (8.166) with the Hyperion-like parameters and . The initial conditions are and . Here, .